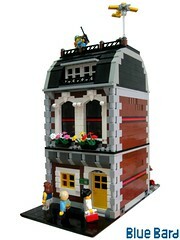 Brick Town Talk: Blue Bard's Weird Social Club - LEGO Town, Architecture, Building Tips, Inspiration Ideas, and more! A great little building with two floors for the strange and funny. Visit the second floor for some music or hang out with the old lady and her cat on the first. Do this all while watching an RC plane on the roof and some gun sight adjustment for a dummy. Every city needs that "weird part of town", and Blue Bard addressed that issue first hand.